"It's not your job to interpret tears." Short Term 12 is a powerfully earnest and skillfully heartfelt drama about human struggles and the cyclical nature of abuse from child to adulthood. Sophomore filmmaker Destin Daniel Cretton crafts a genuinely effecting, naturalistic film full of raw performances and emotional honesty. In the performance of her life, Brie Larson plays a tough but vulnerable care worker, and former foster child herself, taking care of children in the titular group foster home for troubled kids and at risk youth. Cretin's assured writing and direction is so confident and fluid, carrying every story point superbly and sincerely despite some heavy, often messy, subject matter. The film never wavers as it invests heavily in its characters, building momentum and dramatic tension. In the film's opening few scenes, the setting and characters are perfectly explained without awkward or manipulative exposition. The rest of the film is just as seamlessly structured as it telegraphs emotional points and arcs with its story referencing histories of abuse naturalistically. Each of the characters, particularly the children, have painful stories treated maturely. One of the most sincere and powerful scenes of the year occurs when Marcus (Lakeith Stanfield), an abused teen about to age out of the foster care system, performs a expletive filled yet intensely poetic rap about experiencing abuse at the hands of his mother in front of an awe struck John Gallagher Jr. Cretton is never afraid to explore the harsh realities of these children while balancing it with more heartwarming themes of growing up. The film never devolves into sentimentality while it sets off the mechanics of its rather conventional yet emotionally honest story well as Cretton proves himself a more than capable filmmaker. Rested on Larson's incredibly adept and wholly convincing performance, it's a heartbreakingly authentic portrait of life in a group foster home. 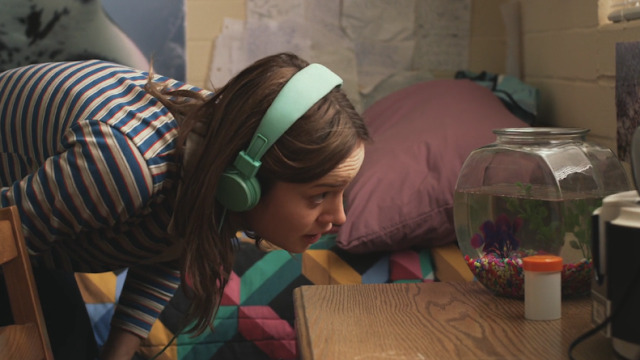 Short Term 12 is easily one of the year's best dramas and an intimate and cinematic portrait about the darker side of youth.